Buffalo Chiropractic Center provides effective and natural neck pain treatment for patients in Cheektowaga, NY. 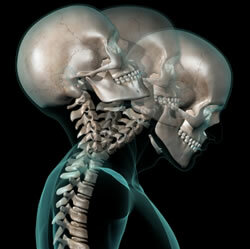 Auto injuries or other traumas: Whiplash is a common injury after an auto accident. A collision can result in your head and body being jerked in opposite directions, which can damage the ligaments and discs in your cervical spine. Some people may suffer neck injuries from other accidents while playing sports, working, or participating in other activities. Aging: The joints in your neck naturally degenerate over time. As patients get older, many develop conditions such as osteoarthritis, spinal stenosis, or degenerative disc disease. These diseases can cause significant neck pain. Poor posture and muscle strain: Improper posture can place strain on your cervical spine and the surrounding muscles. This muscle strain can cause neck pain and overuse injuries, especially if your work involves hunching over for hours at a time, such as computer work. Nerve compression: Herniated discs, bone spurs, and spinal degeneration can all lead to compression of the nerves within the cervical spine. This compression can cause headache and pain that radiates from your neck to your arms and shoulders. Chiropractors use gentle and effective chiropractic adjustments to correct spinal alignment, restore mobility in restricted joints, heal damaged tissues, and ease pain. Patients with neck pain are often treated with spinal adjustments applied to the cervical spine. In addition, chiropractors often treat neck pain with other methods, such as exercise rehabilitation, mobilization, and massage. These active treatments help to heal spinal damage and strengthen muscle tissues. Dr. Palmer will work to determine the source of your neck pain, assessing the condition of your cervical spine and locating any possible dysfunction. We will evaluate your posture, neck range of motion, and spinal alignment. Then we will design a custom treatment plan to address your pain now and into the future. At Buffalo Chiropractic Center, we have helped hundreds of patients with neck pain relief. Call our office today to learn more about how we might help, at (716) 668-2225.